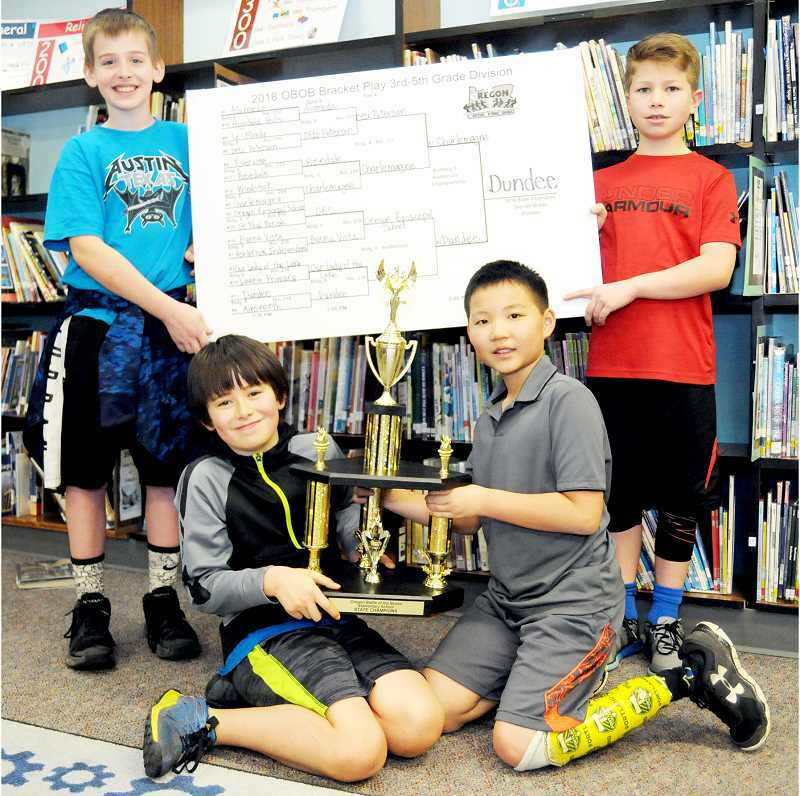 SALEM -- After steamrolling their way through the Oregon Battle of the Books regional competition, Dundee Elementary School's Awesome Doritos team faced a much more difficult task at the state tournament April 7 at Chemeketa Community College. The fourth-grade foursome of Ben Clodfelter, Josef Moisan, Donovan Milstead and Kota Yamamoto lost their first two matches of pool play and were ranked near the bottom of the 25 teams in attendance, but rallied in their third and fourth battles to qualify No. 11 out of 16 teams for bracket play. The Dundee team proceeded to beat the No. 6, No. 3, No. 2 and No. 5 seeded teams in succession to win the title and become the first team from Region 2 -- which includes Yamhill, Polk, Marion, Lincoln and Benton counties -- to achieve that feat. "I was really impressed with the way they gained steam every time," Dundee Principal Reed Langdon said. "They started out slow, but they didn't ever lose confidence. They got better and better under pressure. That was really cool to see. They're a super neat group of kids." The team's run included a dramatic win over No. 3 Our Lady of the Lake (Lake Oswego) in the quarterfinals. The teams ended the match tied 40-40, but the Awesome Doritos used their opportunity to challenge a question that had been judged to be incorrect. The team had two minutes to find proof in the text that their answer had been correct. The judges debated for nearly 10 minutes before ruling that Dundee's answer had been valid, which meant they received five points and five points were taken away from Our Lady of the Lake (because if their answer had been accepted initially, their opponents would not have had the opportunity to steal) and make the final score 45-35. "That happened to us in pool play so we learned from our mistake," Milstead said. The Awesome Doritos had a relatively comfortable win over No. 2 Oregon Episcopal School in the semifinals to set up the title showdown versus No. 5 Charlemagne Elementary from Eugene. Dundee was able to get a steal to take an early 15-5 lead and never trailed en route to a 75-63 win during the 32-question final round. Newberg librarian Korie Buerkle, who serves on the OBOB state board and organized the regional competition, said she really enjoyed seeing the group in action. "I have seen them grow as a team," Buerkle said. "They work really well together. I know that the team decided that all of them wanted to be spokespeople so they all read all 16 books, which definitely helped them win." The foursome have gotten a lot of attention at school and will even put on a mock battle for the Newberg School District board at its April 24 meeting. "We're kind of celebrities," Clodfelter said. Buerkle said she expects to see participation at Dundee and across the school district increase next year because of their success. "Every time I think about it, it makes me so happy because you see kids year after year working so hard, reading all the books, quizzing each other and everything they've done to get ready for this," she added. "Then you see them win and they're great sports about it. This is just such a big win for our community. What a great example."